phylicianicole: Real Talk Tuesday: Opt Out(side). 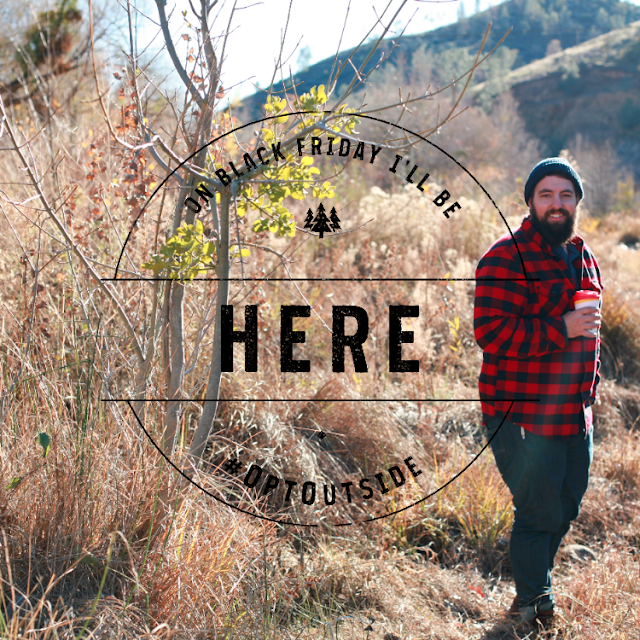 Did you hear what REI is doing on Black Friday? THEY ARE CLOSED. Yes, closed. On Black Friday... only one of the biggest shopping days of the year. AND they are paying their employees to GO OUTSIDE. They are closing ALL 143 stores and freeing their people to do what they are all about, the great outdoors. When I received this email yesterday I was so stoked for a few reasons. I am not a black friday shopper. Actually, I am not much of a shopper in itself so add crazy lines, psycho people fighting over a deal and manufactured consumerism and I am out. I just can't hang. So I think it is awesome. Another reason I am stoked is because of the bold move a company is making to choose a different value. Amazing! This big move from REI speaks so loudly in many ways beyond shopping. Black Friday has become a holiday. Forget Thanksgiving. Let's make stores open on Thanksgiving and be open 24 hours while were at it. Let's promote crazy deals so people think they can't possibly miss out on this occasion. Forget a day with family. Forget going out of town. Forget a day off work to connect with nature. Forget shopping any of the other days available. CONSUME as much as you can, as quick as you can. It is stressful and you might get trampled but hey, it's fun! It didn't start this way. Stores weren't always open. Stores weren't always open crazy hours. But each year had to top the one prior. Deals were added. Hours were even crazier. More and more people have to work this over the top occasion. And more and more people consume for themselves in unnecessary ways because "I can't miss this great deal." Ok, so what am I getting at? 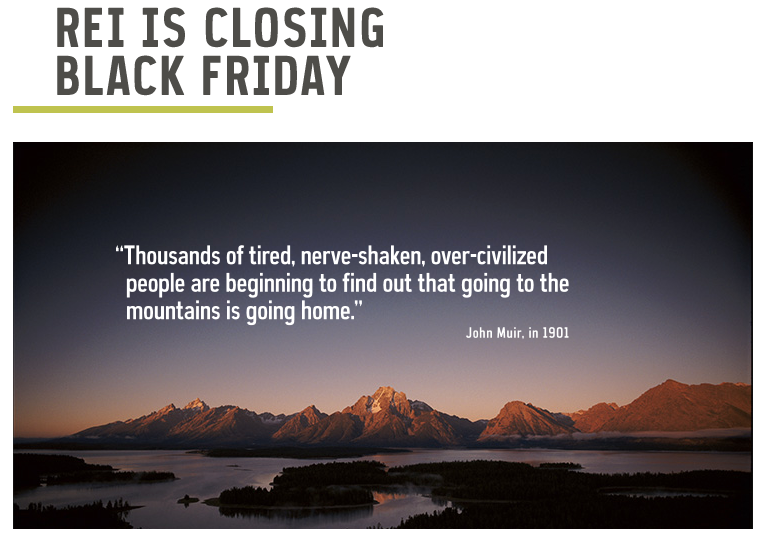 I think REI's choice to say that their passion for people to experience what happens when you spend time in nature matters more than making a ton of money on Black Friday is a good slap in the face for us. I don't blame them for being on board with black friday in the past but I commend them for evaluating and choosing something different now. Little by little culture has created a phenomenon in black friday and maybe we need to make a big choice to value differently. This is a call to evaluate, ask questions and maybe choose better. This just makes me think about other areas in our lives. Where have we let small things creep in and eventually take over? Are the things I say I value evident in the way I live my life? What incremental changes have slowly become a new way of life? Maybe a not so good one? There are so many things I could list about how I think our culture/generation needs a wake up a call, but I'll leave it at things I know for myself. I think REI's choice to do something drastic and in stark contrast of the expected for a large retail company is challenging us where we need to do the same. This quote speaks to me and an ongoing desire to have more access to the mountains. Maybe it isn't the mountains for you. What does going home feel like for you? Where might you need to return to this comforting, valuable state? Maybe it is picking up the phone to connect with a long time friend. Maybe it is choosing to leave your phone in the other room while you share quality time with someone. Maybe it is choosing to engage your hobby/passion in your free time. Maybe it is being willing to dream. And pursue that dream. Maybe it is choosing to seek help in an area of life that is occupied by a struggle, grief or addiction. Or maybe it is making time for something/someone you love despite how busy life is. Whatever it might be, I am reminded we have a choice. If an important area has lost value in your life, make a shift. If something is missing, pursue it. Sometimes we have to challenge the things that have become normal and seem good. Choosing something crazy like closing your retail stores on black friday is risky (All good things are, right?). You might lose profit. You might disappoint. You might get ridiculed. BUT you might find peace. You might reconnect with something so valuable to you. You might challenge others to return to something so good. You just might win. Wherever it is, let's go home. I am totally in for the REI get outside campaign. The Friday after Thanksgiving usually looks like Thanksgiving with the Stoicu side and some time near the Kern River. This is good for our souls.